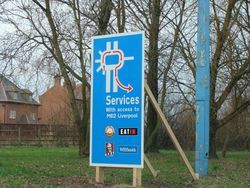 An offline service area is one that is not immediately adjacent to the road it is serving, so motorists have to negotiate a junction in order to access it. This design became very common in the late 1980s and 1990s and continues to be seen in proposals today. A sign explaining how to get around the junction to Burtonwood. Unlike in the UK, in Ireland the phrase "offline services" is used publicly, with road signs saying "offline services available". Official government-owned services are always of the online type, while private companies can't apply to have a motorway serve their own facility. Instead they can built their own facility at an existing motorway junction, and this gets signposted as a tourist attraction. Queues for Cherwell_Valley at M40 J10. For many in the UK, offline services are associated with long queues and complicated roundabouts. When the first motorways opened, the Ministry of Transport never ruled out the option of building services at a junction, but usually gave way to concerns about traffic at the junction. They also made a point that as most motorway roundabouts were built above the motorway, to bring a service station up to that level would require a significant investment (at the time, the Ministry paid for all the roads within service stations). At Aust and Scratchwood there were simply no other suitable locations, so those services were allowed to be built at junctions. Gordano and Exeter soon joined this category, but all other services were built in the conventional online style. By the 1980s, highway engineering policy began to place less emphasis on traffic flow and more on environmental considerations. In addition, many operators had highlighted the point that they preferred services at junctions because they were cheaper to build and run, meaning they would pay more rent. The opening of the M25 was a turning point for this. In the years leading up to the M25, the Department for Transport had struggled to generate interest in new services. The completion of the M25 was rushed, and it and the surrounding roads needed new services urgently. To avoid battles over green belt land and complicated studies in to how new services would affect traffic flow, almost every service area built during this period was built at a junction. The busier the junction, the better: operators were less hesitant if they knew they'd get a lot of trade. 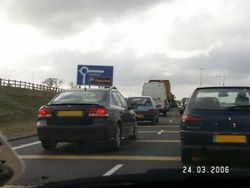 It was during this period that South Mimms, Birchanger Green and Thurrock were designed, three of the most controversial services in terms of traffic congestion. This became even more common after 1992, when services became privately planned. Developers almost exclusively considered junction sites because they were much cheaper to build. In 2008, the Highways Agency put a stop to this, by saying no more services should be built at junctions unless there is no other option available. In 2013, their wording was weakened, and they simply said that if there were two otherwise idential proposals, they would prefer the online option. Burtonwood and Northampton can both be regarded as offline services, but they started out as online ones: they had a motorway junction built around them. There is a third design which falls into neither category, where the services take the design of an offline service area but are accessed via their own junction. This is an expensive attempt to get the best of both, with Cobham being the most well-known. Pages in category "Offline servces"